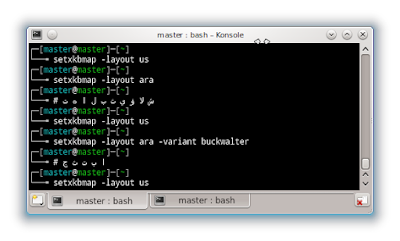 We can easily change our keyboard layout in Linux by Terminal commands. 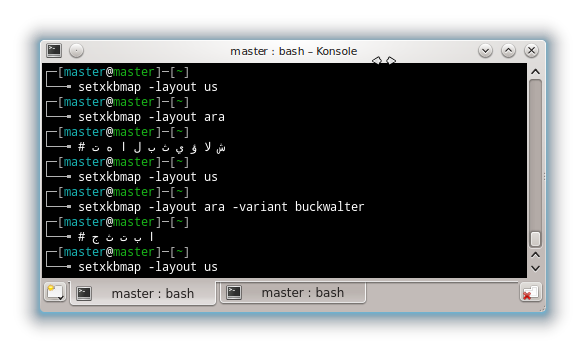 It is easier and faster at many times compared to GUI. You can change layout by just up or down arrow key. Remember, many cases happened when people change their layouts and they can't revert them back. Avoid it by number 1 step below. Yes, you must do command for default layout first (US) or you will find difficulty to revert the setting into default again. We have 'parent language' (Arabic) and also 'children language' as variant/dialect (Buckwalter etc.). Note: Buckwalter is an Arabic variant which has similar result with Multikey program on Windows while you may type A for ALIF, B for BA', T for Ta' (phonetically associated keys), and so on. Buckwalter variant helps us to write Arabic easily without any additional tool.